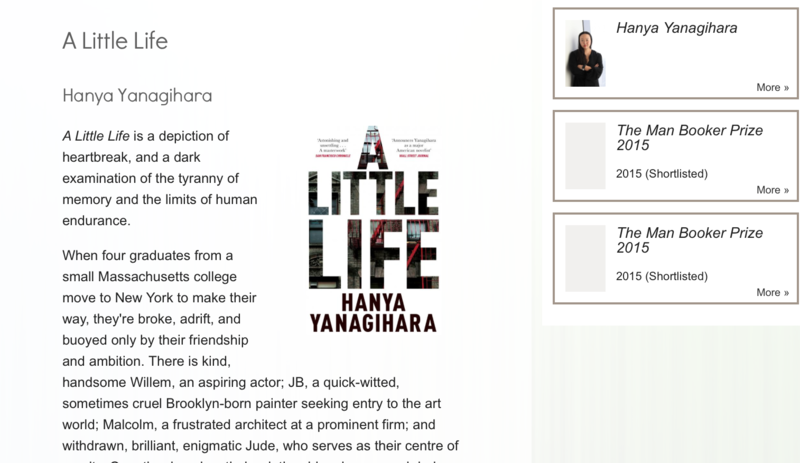 Kate Johnstone reviews A Little Life by Hanya Yanagihara (published by Picador), shortlisted for the Man Booker Prize. Hanya Yanagihara’s first novel (The People in the Trees) took her years to write, and although well received, sank without trace. Her second, A Little Life, was written in an astonishing 18 months (it’s over 700 pages long). Critically acclaimed and becoming a bestseller, it has been shortlisted for the Man Booker Prize and is odds-on favourite to win. Its popular success is all the more remarkable when you consider that it has been described as ‘harrowing’ and ‘unrelenting’, and many reviews have discussed how upset the book made them. I was in two minds about whether or not I could face reading it. I’m not drawn to misery memoires or fictionalised ‘misery-lit’, where any amount of ghoulishness is justified on the basis that it supposedly reveals some inner truth. I did pick it up though. And, cliché though it is, I couldn’t put it down. A Little Life starts gently, as we are introduced to the four main characters – Jude, Willem, Malcolm and JB. They first meet each other at a college much like Harvard, and become each other’s firmest and best friends. Jude and Willem are especially close. They graduate, and start to face up to the usual challenges of finding work, accommodation, relationships. So far, so conventional. Others have mentioned the similarities with Mary McCarthy’s The Group, which followed a larger group of graduate friends. Any resonance with this story arc is no doubt entirely deliberate, and one of Yanagihara’s many strengths is her ability to play with convention. This comfortable middle class world shifts at about 70 pages in, when we are faced with a dramatic turning point. Jude awakens his roommate Willem to tell him there’s been an accident, and is bleeding profusely from his arm. We have been subtly alerted to something about Jude which is different from the other three. Not just his orphan status (Willem too is an orphan), but how reserved he is, and how uncomfortable he is with his body – he walks with a limp, and keeps himself covered up. The bleeding arm is of course a self-harming incident which has gone wrong. It is the first of many, many incidents of self-harm in the book. The descriptions of self-harm are so visceral that they are at times almost impossible to read. Yet they did not seem to me to be ghoulish. Yanagihara is willing to stare right at the source of pain, both physical and mental, and will not turn away. It is no surprise that behind this self-harm is something truly appalling, although perhaps in our modern era not as difficult to believe as it might once have been. Yanagihara leads us deeper and deeper into this world. We don’t want to go there, but we know we must. What I found so remarkable was that I simultaneously dreaded, and was desperate to know, what would come next. There is much that seems to be wrong with how this book is written. It has an extremely narrow focus, where it’s only the lives of the characters we hear about, and there are no contemporaneous references. It’s hard to believe there could be a novel largely set in Manhattan which passes through 2001 without a single person mentioning 9/11. But this is that book. It can only be a deliberate choice by the author, and it should detract from believability. The characters also shouldn’t work. Although written by a women, it is almost entirely populated by men, most of whom are gay: another challenge to credibility. Some characters are pushed to the background and only allowed back in to further a plot point. Others, such as Willem, are too good to be true. The effect is a form of heightened reality. Yet given the subject matter, hyper-reality seems completely appropriate. Perhaps the most challenging aspect of this novel for a psychologist is having to consider the limitations of what we can do to fix a broken mind. As Jude’s story unfolds, we have to stand watching on the sidelines, desperate to help. We share the frustration and occasional anger of Jude’s friends, who also feel powerless. The question is whether we would be able to help in the real world. This is, without a shadow of a doubt, a deeply upsetting book, and it is not for everyone. But if you feel up to it, and want to read a novel about love, hate, compassion, cruelty, friendship and survival, it is unmissable. - Reviewed by Kate Johnstone, Associate Editor (Reviews).